Only eligible if you are in Grades 4-8! The 10,000 Shot Club is a great way to practice your basketball skills from June 1st to October 1st. 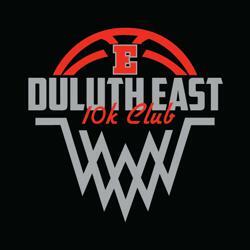 An EBA Board Member sends an e-mail to all registered Duluth East Basketball Players in June with information on how to get signed up. The same information is posted below. Remember to use a shot tracker to track your shots (there is one posted below). You will earn FREE 10K Club T-Shirt. How do I get a Shot Tracker? Please click the following link. This will take you to the Shot Tracker. All you have to do is insert the shots attempted each day and program will count your total attempts for you. 1. Click on the "File" Tab at the top of the screen. 2. Then, you will get the option to select "Make a Copy". This will allow you to make edits to the sheet without affecting the master copy. 3. Save it to your drive. Then, players will be able to use this as a shot tracker throughout the summer. PLAYERS CAN ALSO PRINT THE SHEETS AND DO THE MATH ON THEIR OWN.